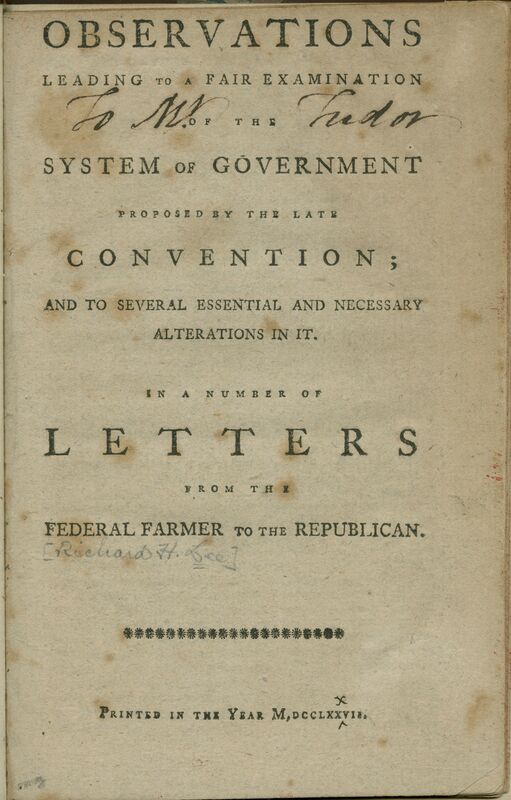 Three weeks after the convention ends, one of the first of the many letters debating the proposed Constitution appears in published newspapers. The discussion will revolve around whether the Nation should remain as it is, a confederation of thirteen sovereign republics, or if it should move to a single central government. Already dividing lines are being drawn between those who favor the new Constitution and those who fear that it goes too far and takes too much away from the individual States. By this point, virtually every newspaper in the country has printed a copy of the proposed Constitution, allowing every citizens to read it or at least hear it, and to discuss it among themselves. This is the moment when every man will have to decide for himself under what impressions he will act. For this first, and perhaps only time in all of history, the People are asked to decide their form of government, not just who will be the leaders. And the debates, are just beginning. Posted on October 8, 2015, in Constitution, Dave, Podcast, Ratification Debates and tagged Constitution, Ratification Debates, The Federal Farmer. Bookmark the permalink. Leave a comment.